Not exactly a highlight of Thailand but it’s very close to Bangkok. In Bangkok there is one of the main street named after this city: Petchaburi Road. Main attraction is the Phra Nakhon Khri Historical Park. This is located on a hill central in the city. This old palace is also known as Khao Wang and build by king Rama IV. The temple Wat Mahathat Worawihan is also build by the Thai royal house. Five kilometres outside the city is the Tham Khao Luang (Khao Lunag Cave). 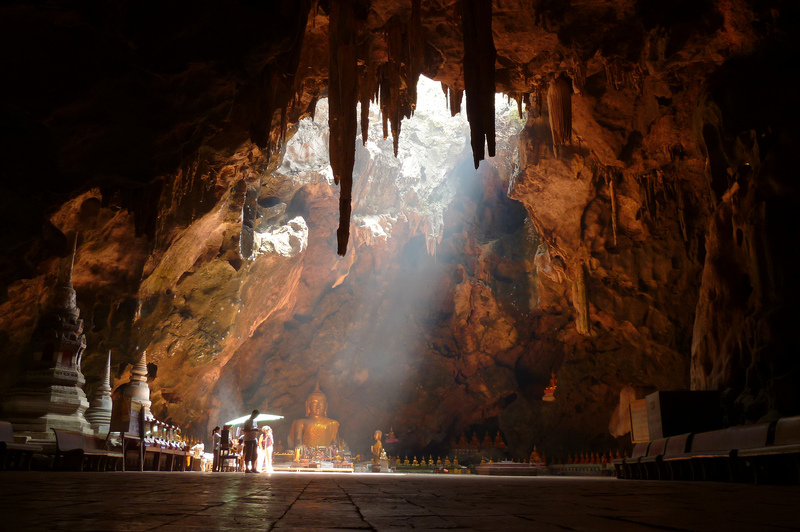 This very huge limestone cave is well known because the important ornamented Buddha image built by King Rama V. The natural light shining through the hole in the roof makes the place very photogenic. Khao Luang, Phetchaburi. Source: Flickr.